If you’re looking to the Founding Fathers for a role model, you could do worse than Alexander Hamilton, the self-taught orphan from the Virgin Islands who went on to create the U.S. financial system, the Coast Guard, and, in a break from politics, The New York Post. Inspired by the hit musical by Lin-Manuel Miranda, author Jeff Wilser (who has previously contributed to mental_floss) dug through the prolific Hamilton’s documents and letters—as well as those of his colleagues and biographers—to create Alexander Hamilton’s Guide to Life, a tome full of wisdom from everyone’s favorite treasury secretary. 1. GENIUS COMES FROM HARD WORK. Hamilton’s absurd work ethic was a theme throughout his life—over the course of a few months, he wrote 51 essays included in The Federalist Papers (compared to James Madison’s 29 and John Jay’s five). He did it all while keeping his day job working full time as a lawyer. A prolific writer, Hamilton didn’t let little things like sleep get in his way. In 1791, Congress was in an uproar over whether or not a national bank would be constitutional and George Washington had only 10 days to decide whether or not to veto the controversial bill that came before him. 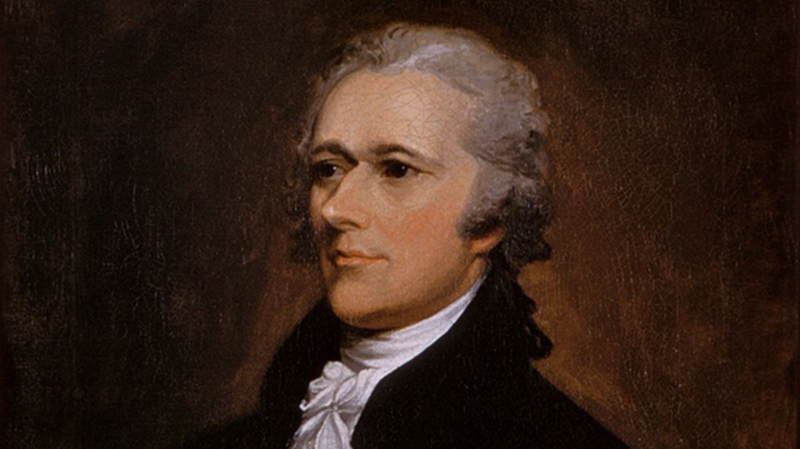 Hamilton—with the help of his wife, Elizabeth (often called Eliza)—stayed up all night and dashed off some 40 pages in favor of the bill, rebutting anti-bank arguments from men like Thomas Jefferson and James Madison. Hamilton could always be counted on to get his work done on time, if not early. “I hate procrastination,” he wrote in a letter in 1795. In a letter to his friend John Laurens written when he was 22, Hamilton shows more than a passing interest in landing a sugar mama. Discussing what he would require in a future spouse, he mentions money multiple times, saying in one instance, “as to fortune, the larger stock of that the better … money is an essential ingredient to happiness in this world—as I have not much of my own and I am very little calculated to get more either by my address or industry—it must needs be that my wife, if i get one, bring at least a sufficiency to administer to her own extravagancies.” Though he may have been joking around a bit, the man was pragmatic to a fault. 4. DON’T FIGHT FOR A CAUSE YOU DON’T BELIEVE IN. As a lawyer, Hamilton was occasionally asked to defend behavior he didn’t really condone. He took no issue with defending British soldiers who were prosecuted for crimes they committed during the Revolutionary War's occupation of New York City because he felt that the law was on their side. But in a case early on in his career, he defended someone he knew to be guilty and came to regret it: He successfully defended a woman who had stolen a fan. “I will never again take up a cause in which I was convinced I ought not to prevail,” he later decided. 5. DON’T TAKE ON DEBT YOU CAN’T PAY. Despite being a crusader for the national debt, Alexander Hamilton wasn’t always a proponent of borrowing money. “The creation of debt should always be accompanied by the means of extinguishment,” he argued in 1790 during his campaign to have the U.S. federal government assume states’ debt from the war. In other words, debt is all good and fine—as long as you have a way to pay it back. Alexander Hamilton wouldn’t have been caught dead in athleisure. “A smart dress is essential,” he declared in a 1799 letter. He was talking about soldiers—he raised America’s first standing army and personally designed George Washington’s uniform during the Quasi-War between the U.S. and France from 1798 and 1800—but the advice applies to any endeavor. As a self-made man, Hamilton was all about dressing for the job you want. 7. DON’T FORGET TO SPEND TIME WITH YOUR FAMILY. While he was busy helping a fledgling nation come into its own, Hamilton still found time to be a family man. (He and his wife, Eliza, had eight children.) “Experience more and more convinces me that true happiness is only to be found in the bosom of one’s own family,” he wrote to Eliza in 1801. According to his family doctor, in the midst of his business as a statesman, whenever someone in his family got sick, Hamilton rushed home to nurse them back to health—literally; he insisted on administering all the medicine himself. 8. DON’T LET THE HATERS GET YOU. Hamilton was a famously decisive figure. While he was a beloved adviser to George Washington, he was loathed by some of the other Founding Fathers. In 1790, he encouraged George Washington to raise a militia to stamp out the Whiskey Rebellion—ultimately a peaceful end to the tax conflict—but it wasn’t a popular stance. “The very existence of government demands this course,” he maintained. Taxes were the only way to pay off the government’s then-$54.1 million federal debt. He was right, but that didn’t mean either the public or his fellow politicians agreed. Thomas Jefferson called the whole thing “Hamilton’s Insurrection.” Luckily, he never treated government like a popularity contest (even if he did have that dueling problem). “I have learned to hold popular opinion of no value,” he wrote to Washington in 1794. Alexander Hamilton was never too far from conflict, as the Whiskey Rebellion incident underscores. His greatest accomplishments—the creation of the U.S. banking system, founding what would become the U.S. Coast Guard, encouraging the manufacturing industry—turned out to be visionary, but weren’t readily accepted by contemporaries like Thomas Jefferson, James Madison, and John Adams. But he saw conflict as a time to shine: “A man of real merit is never seen in so favorable a light as through the medium of adversity; the clouds that surround him are shades that set off his good qualities,” he wrote in a letter to a friend in 1780. Following his ultimately fatal duel with Aaron Burr, Hamilton lay in bed in intense pain for several hours before he finally passed. As Wilser tells it, he took one of his final moments to absolve his opponent. “In one of Hamilton’s final lucid moments, he said, ‘I have no ill will against Colonel Burr … I met him with a fixed resolution to do him no harm. I forgive all that happened.’” Even in moments of great pain, he maintained his integrity.